Trans* here is used as an umbrella term to describe the spectrum of identities of gender variant people, which includes (but is not limited to) transgender men and women, transsexuals, transvestite, genderqueer, genderfluid, genderless, and bigender people. Historically, trans* communities have been one of the most medically underserved populations in the United States. 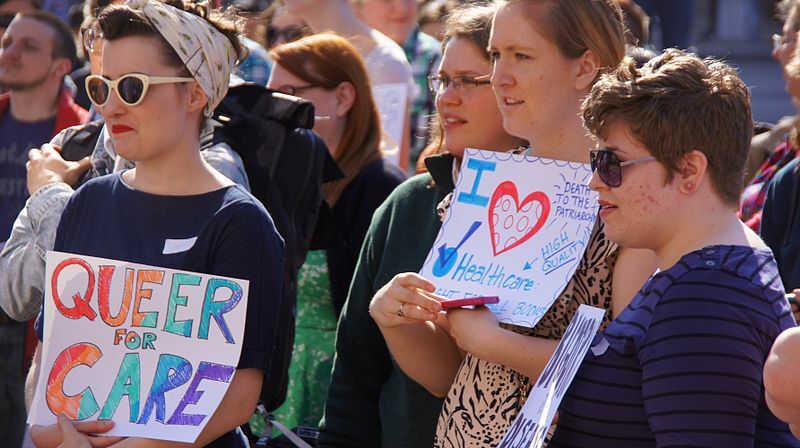 With the passage of the Affordable Care Act (ACA), trans* people have greater access to health care than ever before. However, insurance coverage is not enough to ensure quality care, as medical settings have a long legacy of excluding and alienating transgender and gender-variant people. Prior to passage of ACA, the Transgender Law Center reported that in California alone, 46% of trans* people delayed seeking health care because they could not afford it, and 26% of those people experienced worsened health as a result. Other studies found that 18% of trans* people nationwide have been denied health services because of gender identity. Those who received care experienced severe discrimination, with 70% reporting that medical professionals refused to “touch them or [used] excessive precautions; medical-care providers [used] harsh or abusive language; providers [were] physically rough; or health-care providers [blamed] them for their health status.” As trans* populations face more violence, less economic opportunity, and higher rates of HIV than other populations, compassionate and quality health care is urgently needed to address these significant barriers to health. Yet trans* visibility is rapidly increasing. Articulate pop culture icons such as Laverne Cox are helping raise awareness of trans* people, which has helped build support for anti-discrimination campaigns, including the movement to end health care exclusion. Under ACA, trans* people can no longer be excluded by being classified as having preexisting conditions. But the ACA is no magic bullet, and implementation varies from state to state. For instance, hormone therapy may not be covered by insurance, or necessary medical procedures may be denied because insurance companies deem them gender inappropriate. For example, a trans* man who has changed his birth certificate, but has not had gender reassignment surgery, may no longer be covered by his insurance for a pap smear, although he would still require routine gynecological care. Part of the problem is that insurance systems lack a basic understanding of trans* needs and identities, which is also reflected in clinical settings. Even well-intentioned providers may have misconceptions about the needs and desires of their trans* patients. Health advocate Danielle Castro has noticed that many “providers make…assumptions about all trans people — thinking that everyone is on the road to transition to ‘another side,’ to become part of the heteronormative gender binary,” rather than understanding gender as the far more complex experience that it is. Such assumptions make little room for people who identify anywhere along the spectrum ranging from neither gender to both genders, or for people who go through a prolonged transition process. Inexperienced clinicians and administrators may feel that they are insufficiently trained to assist trans* patients, both in terms of technical knowledge and interpersonal skills. Often clinical staff are afraid to ask important questions, such as what gender pronouns to use or how to address body parts respectfully. They may also mistakenly address patients by their non-preferred legal names. Activist Devarah Borrego suggests that the remedy would be “explicitly clear conversation and communication from the staff about when and why that would occur, and where it would be needed. And in these places where it is not required by law, the client’s preferred pronoun and name should be the only thing used.” Such mistakes not only damage relationships between staff and patients, but can also cause costly mix ups in paperwork and insurance claims. So what can providers and administrators do to make clinics more accessible for trans* patients? Pioneering community health services like Lyon Martin in San Francisco, California, hold the answers. In collaboration with Transgender Law Center, Lyon Martin runs a comprehensive program called Project Health that works with clinic staff and medical students to improve understanding of trans* health care and to make clinics more inviting for trans* patients. The program includes clinical rotations for medical and allied health students; technical trainings for other clinics in California; and Transline, an online consultation service that providers can search for information about trans* health as well as answers to specific questions pertaining to their practice. Project Health also participates in advocacy work, such as the push to require that Medi-cal (California’s subsidized health insurance for low-income residents) cover transition-related surgeries. The trainings encourage clinics to incorporate trans* health care into their primary health care services, as well as emphasizing the need for specialized care relating to gender transition. Sekera says that the program encourages providers “not to deal with people as trans* but as whole people.” In the course of a visit, a patient might “discuss hormone therapy, say, and also a hurt shoulder,” and a visit would not focus on issues relating to transition if they did not directly pertain to the patient’s reason for the visit. Response to Project Health has been encouraging. The technical assistance program has benefited 20 clinics and contributed to the implementation of new trans* clinics, such as the Humboldt Open Door Clinic in Arcata; and Transline has helped health care providers all over the country feel supported enough to bill themselves as “trans* health providers.” There is much more to be done however. While several clinics in San Francisco specialize in providing trans* health services, there is a great need throughout the country for more primary health care providers who are competent to serve trans* patients. Moreover, Sekera feels that updating the Electronic Health Record (EHR) system to include trans* identities would be a huge boon to the medical community. The EHR is a template that prompts clinicians to ask questions to help determine diagnoses, but its gender categories do not take trans* individuals into account. Changing the EHR would help improve clinical standards and help create a national protocol for working with trans* patients. While Hesperian has not yet developed many materials that specifically address trans* health issues, we appreciate the pioneering work of organizations like Project Health which help expand the definition of “Health for All”, and we look forward to sharing lessons from their experience. Hesperian has addressed how to provide respectful and compassionate care and will be including materials to help health workers discuss gender and sexuality with their communities in the soon-to-be-released book Health Actions for Women. At its core, we see this issue as one of self-determination: to move forward into a future where health justice is a reality, we must not only ensure that everyone is insured but also that everyone receives competent, informed care that makes them feel welcome.